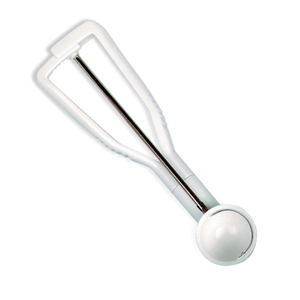 Ideal for scooping ice cream, scoop and drop cookie dough, use to make meatballs and make fruit/melon balls. Measures, 8.5"/21.5cm Made of plastic and scoop has a heavy duty spring action. Also great for dishing up pet food. Hand washing recommended. 8.5"